Getting a tattoo design is something that should require a lot of thinking as the mark lives on forever. Although nowadays, there are already various ways to have the tattoo removed, we don’t want to end up paying a lot of money and going through another pain just to have it removed. One technique of coming up with a tattoo is to think of what inspires you most. If you’re a musician it can be a musical instrument or if you’re a writer, it can be a pen. Or it can also be a wonderful quote or a Latin phrase. Latin is a great idea for a tattoo as it is wonderful language that ancient great philosophers used and it sounds romantic and poetic.Now called a “dead language” , considering it as a tattoo will certainly put life to what really matters. Here are the Latin phrases for your first or next tattoo. This is a Latin Phrase derived from two ancient writers, Theocritus and Cicero. 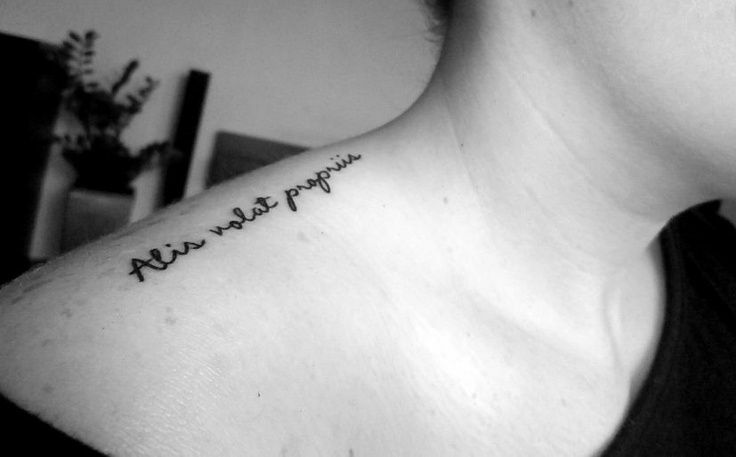 In English, it translates to “While I breathe, I hope”. This would work as reminder for each of us not give up on our dreams no matter where life would lead us. That, while still alive there’s always hope. This is another way to say, continue living. This interesting Latin phrase translates to “That which does not kill me makes me stronger” in English. This is certainly a great tattoo idea for anyone who had gone through a difficult battle in life but chose to focus instead on the lessons from that experience and used that to become a better person. If you’re a strong and independent woman/man who believes that you can do things on your own and is not dependent to anyone or any thing, this tattoo might be for you. This phrase means “She flies with her own wings” Although it makes use of the pronoun “she”, this phrase is gender neutral. It just made use of “she’ as this phrase was originally meant to describe a nation. Some days, we consider living as existing. We wake up, go through our daily activities, end the day and go back to the same cycle. But it that really what life means? This phrase might be an awakening call for us to realize that “Life is more than merely staying alive”. Although this phrase might have a simple and straightforward meaning which means “I struggle but I’ll survive”, This will absolutely be a great tattoo for people who wants to be reminded to live on. Struggle is part of our life. Without it,life’s going to be boring. In the case of movies, the protagonist has experience struggles to make the movie interesting. In real life, hardships are needed for us to feel alive. There are a lot of things that we don’t understand. When a bad thing happens, we begin to ask Why? This even to a point where we challenge God’s existence. “Nature Does Nothing in Vain” means everything happens for a reason. What we are experiencing today may be something that will help us prepare for what’s to come.